The National Trust opened the loft of Penshaw Monument throughout 2012 summer season following the unprecedented interest in August 2011 when the loft was first opened to the public since a tragic accident in April 1926. Here, Paul Lanagan, Chairman of Houghton-le-Spring Heritage Society, takes a look at the famous monument which has graced Penshaw Hill since 1844. Included in the document is a time line of events for the Monument, vintage photographs, plus a transcription of historic graffiti found engraved on the Monument. The Earl of Durham Monument, known locally as Penshaw Monument on Penshaw Hill, was inspired by the Theseion, Temple of Hephaestus. It was built in 1844 out of gritstone. Find our more below. On Easter Monday, April 5th 1926, Temperley Arthur Scott, a 16 year old boy from Fatfield, was killed when he fell from the top of Pensher Monument; public access to the loft ceased until 2011. Penshaw Monument is covered in historic graffiti which is engraved into its stonework. This document features transcriptions of the engravings, the earliest of which dates from at least 1925. 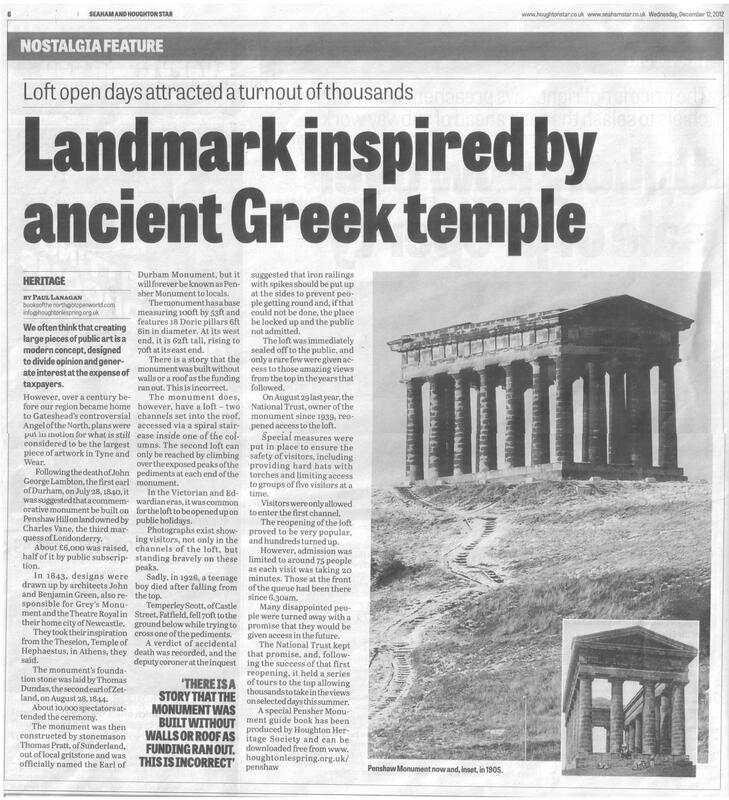 A nostalgia article from the Houghton & Seaham Star newspaper about Penshaw Monument. The article was written by Houghton Heritage Society Chairman, Paul Lanagan, and was published on 12/12/12. The online encyclopedia Wikipedia has an article about Penshaw Monument plus links to other websites showing interative 360 degrees view of the structure. Also included is a transcription of the foundation stone. Penshaw Monument was acquired by the National Trust in 1939. The link below leads to the National Trust's website and has full details of the Trust's tours to the top of the Monument (or Penshaw Loft as we call it).